Detail, Vogue, November 1974. Photo: Chris von Wangenheim. Image: The Fashion Spot. Galentine’s Day calls for slumber party-worthy loungewear. “The Insiders,” a mid-1970s Chris von Wangenheim editorial photographed in interior designer Angelo Donghia’s New York townhouse, includes three Vogue patterns made up in gleaming satin. 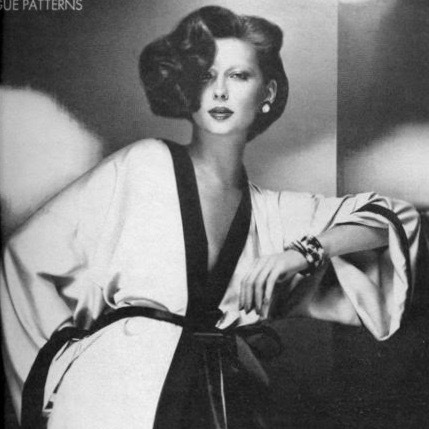 “The insiders… make their own gleam”: loungewear patterns in Vogue, November 1974. Photos: Chris von Wangenheim. Image: The Fashion Spot. See Sighs and Whispers’ repost for the full editorial. Pattern images: Roma’s Maison, Vintage Pattern Wiki.